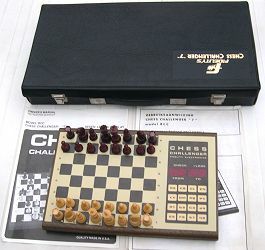 Between 1979 and 1982, the main electronic chess concepts appeared, for instance with, a nice and cheap machine that will become a best seller: Chess Challenger 7; the first "modular" program that has also a good level: Sargon 2.5; a beautiful magnetic wood board: the Auto Response Board; the first "sensory" games - where we can move pieces by pushing the starting and ending square. Fidelity Electronics dominate the market. The hardware price becomes cheaper but the performances are not sufficient. 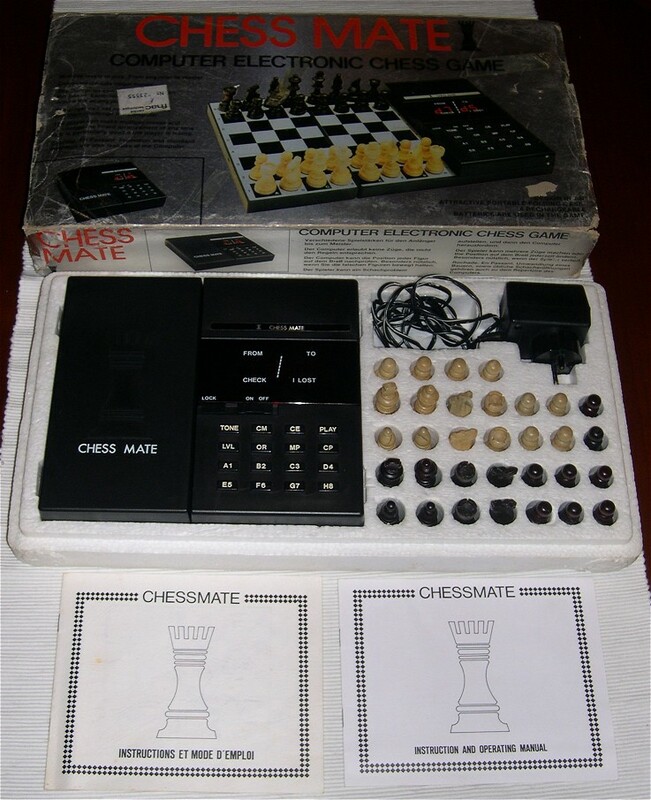 This period stops in 1982 with the coming Elite and Chess Challenger 9: The 2 machines are introducing a new period of great competition between programs more and more powerful: the heroes period. 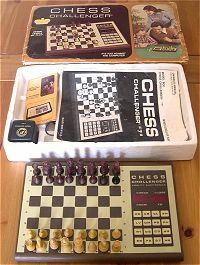 Chess Challenger 10 is an heavy wooden machine sold around 1978/1979. 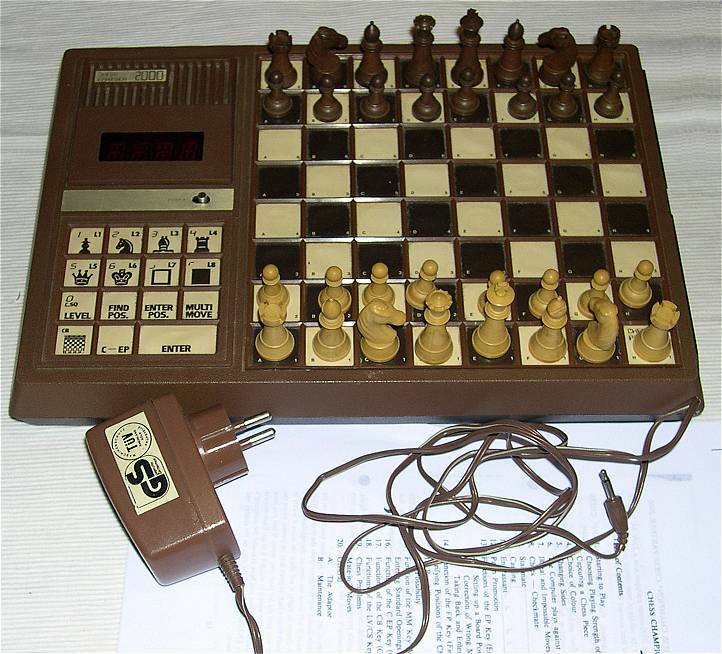 This old model will be soon replaced by Chess Challenger 7, with less performances for a cheaper price. 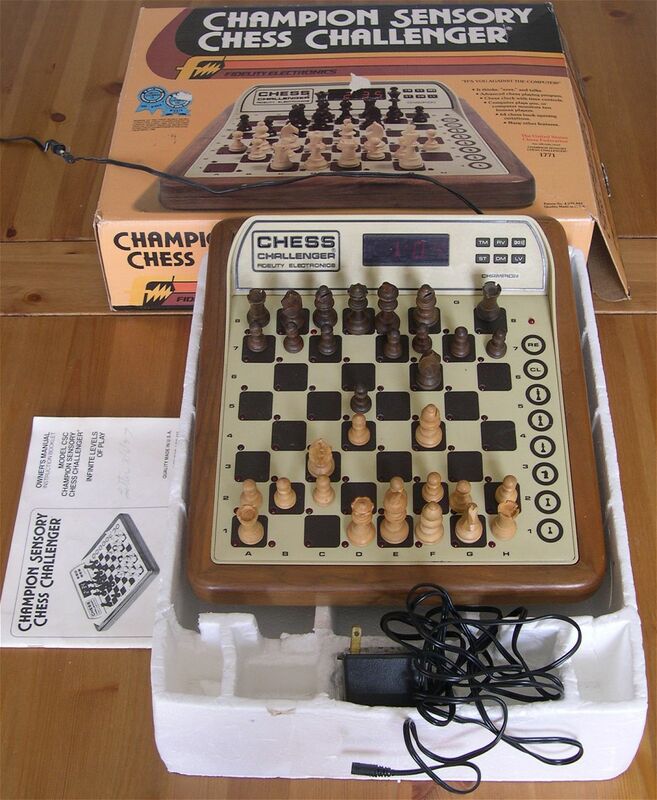 Take a look to this test game and compare it to the Chess Challenger 7 one. The power adaptor is the classical alternative 12V connected using a "loudspeaker" plug. 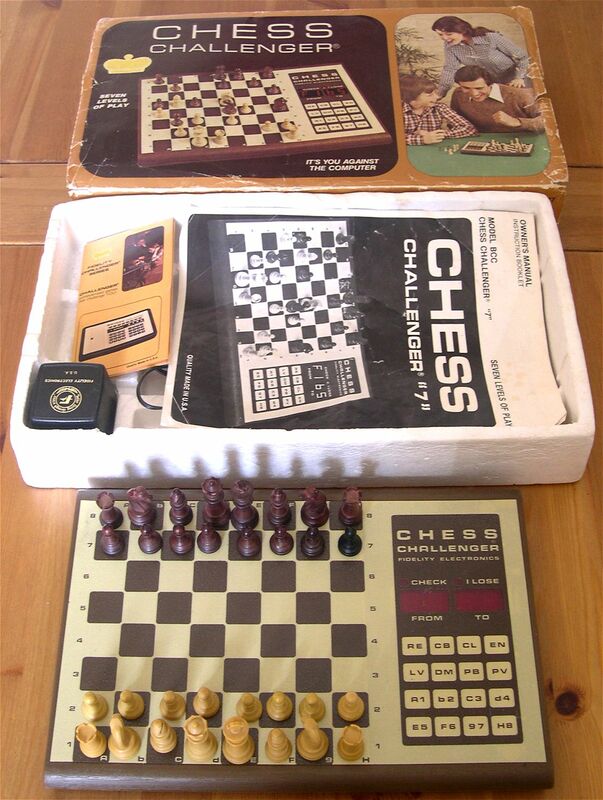 This Chess Mate was in a box in English and French, without trademark, year or country origin. it was bought in 1981. 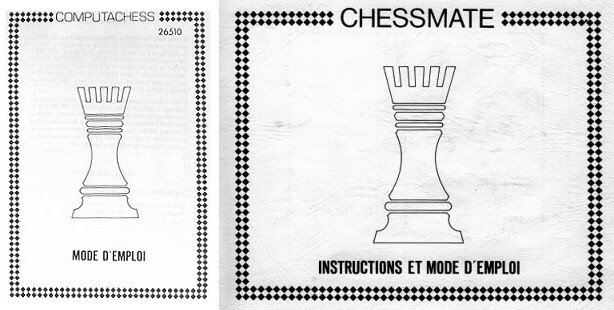 However, the operating manual logo looks like the CXG Computachess one. 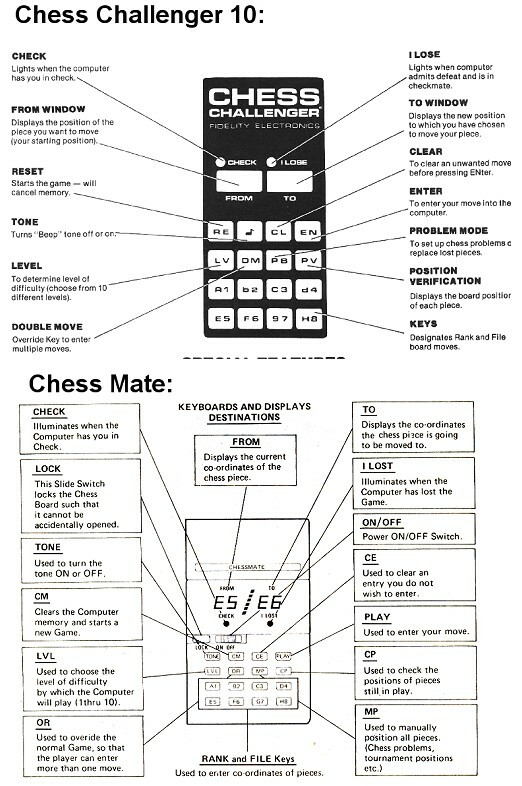 A simple comparison of the playing levels and the keyboard, shows that it's a Chess Challenger 10 clone, with a lower speed. 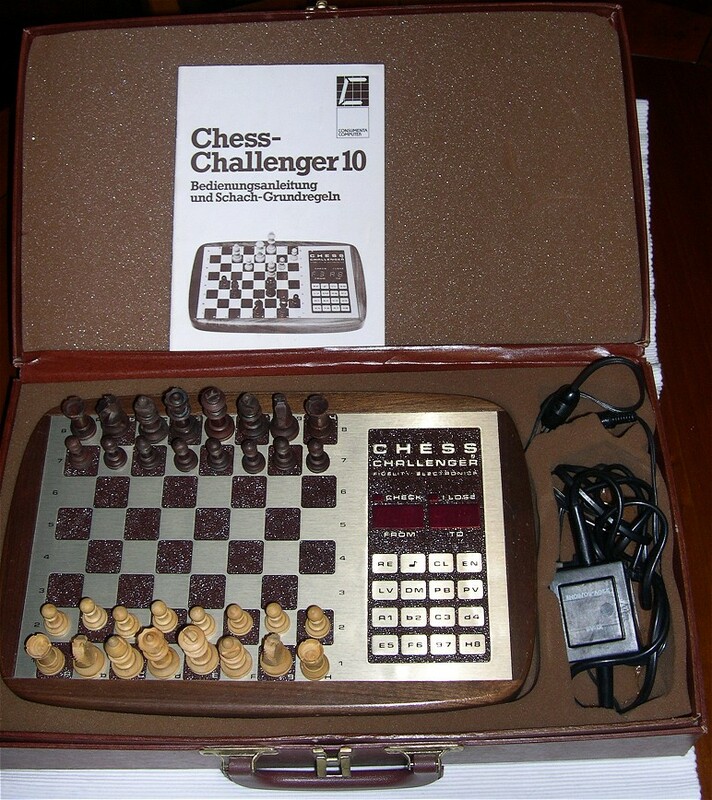 In fact, the user manual is optimistic: the Chess Mate is two time slower than a Chess Challenger 10; the processor is a Z80 / 2MHz instead of 4. 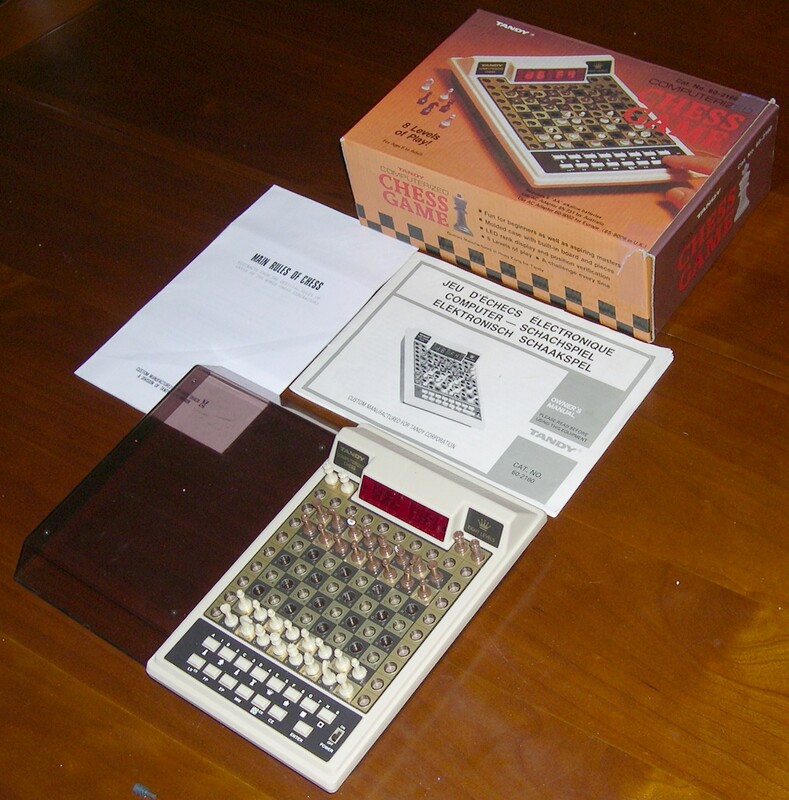 The Chess Challenger is a best seller: The world record in number of one electronic chess game produced (around 600 000 sold). The game for sale is on the first picture. 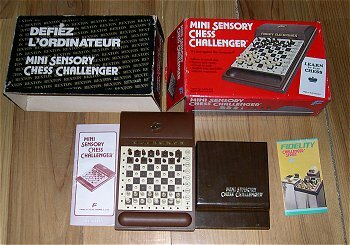 The orange box is a French release imported by Rexton Company, with a specific packaging and a French user manual. On these pictures, you can see the USA packaging and another French box. 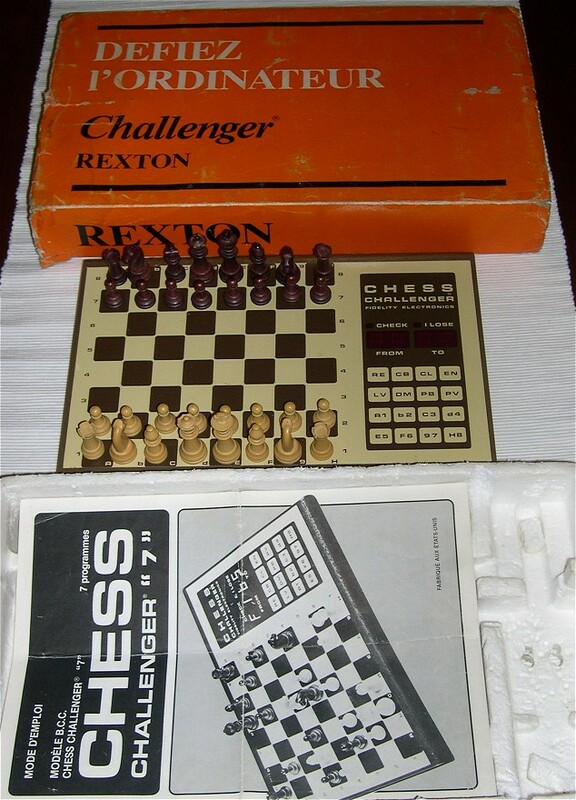 And on this picture a Chess Challenger 7 coming from the Netherland. It was sold inside a briefcase with the logo Chess Challenger 7 and a user guide in English and Dutch. Another Rexton packaging by John and on ebay. 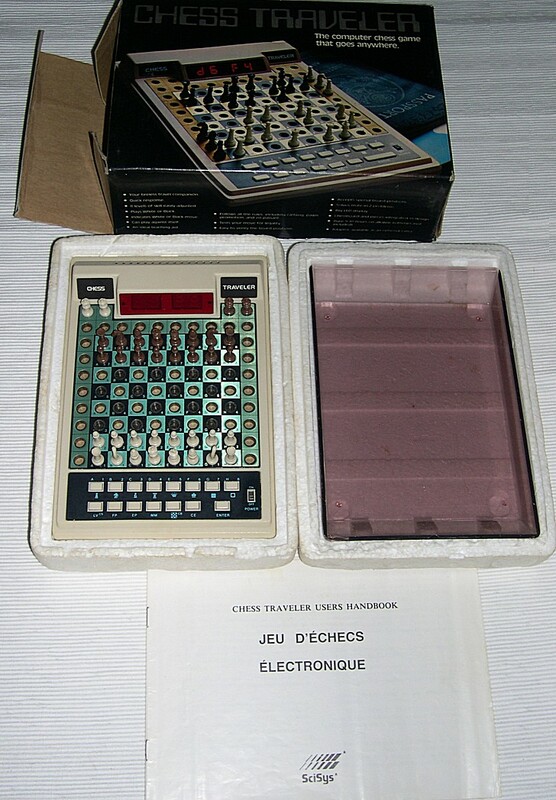 In 1980, the magazine Jeux et Stratégie wrote in its first issue: The best machine available today on the market, but why did they marbled the black squares ? Two month after appeared a real stronger machine: Sargon 2.5 Here is a test game. I had an uncommon French release with a French Voice - I do not have it anymore. This one is from the USA with an English voice. 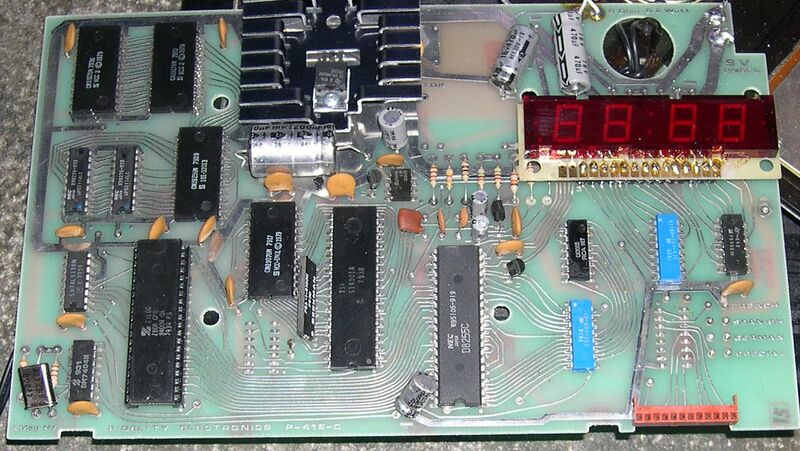 On the motherboard, you can see the Z80A at 4MHz to the left and 4 language options to the right: French, Spanish, German et Special. The Boris Diplomat is from 1980. 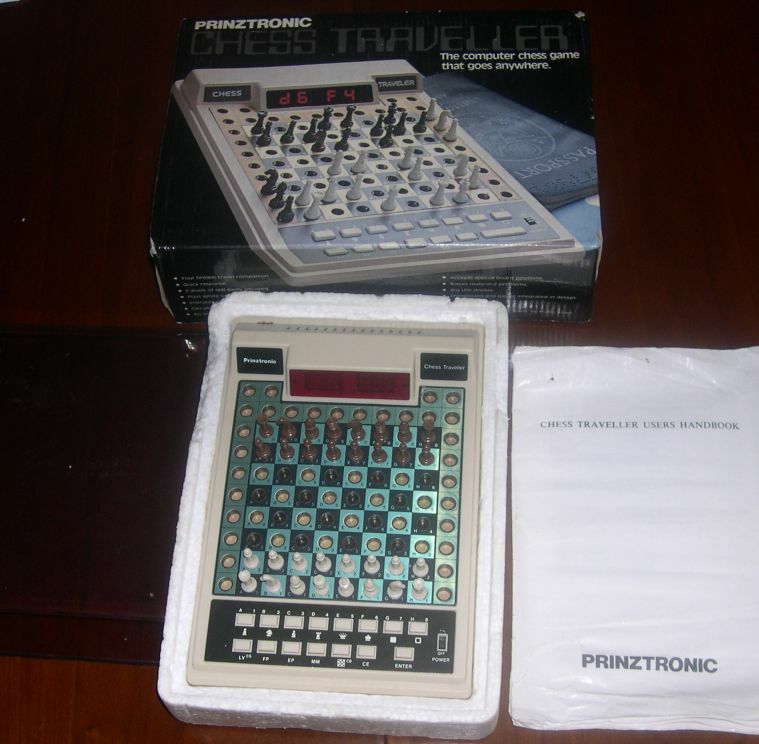 It was sold around 1000F in France (150 euros) and 120$ in the USA. Its main advantage was its compact size. 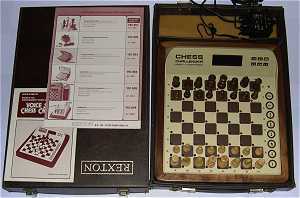 But it was a bit expensive and the market prefered the Chess Traveler that came in 1981 for 700F. The user interface looks similar to the one of the Sargon 2.5 and the great game machine. 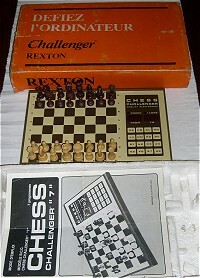 The Software has a level similar to the Chess Challenger 7. In this test game, it defends not so bad. 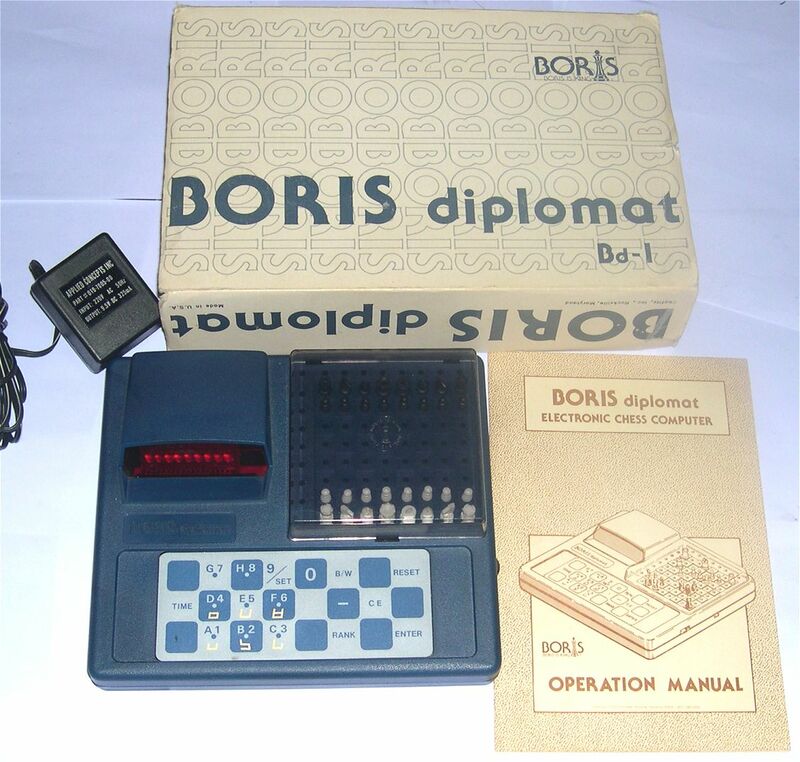 A site about the Boris: Boris is king. the first time I saw this device, it was in a shop called "Le Ludomane" in Troyes, France, in 1980. Like everybody at that time, I was fascinated. Several packaging exist. 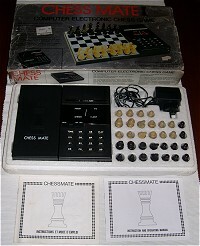 The older one is marked "Auto response Board Sargon 2.5 Computer Chess Program". The hardware content of this historical module is visible on the page "reparing games"
26 years after, the one I just bought has still a lot of charm and I have a great pleasure to play with it. Its offensive style requires a great care. To beat it, you have to benefit from its opening weaknesses and counter attack. Here is a test game quickly finished and another one well made. 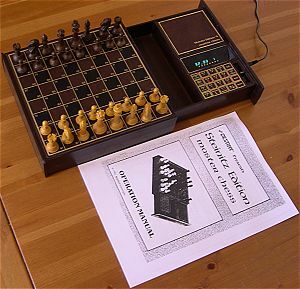 An historical link on the chess programs: the books from Kathe and Dan Spracklen - Sargon, A Computer Chess Program and Sargon III: The Ultimate in Computer Chess (as second hand on Amazon). Sargon is also available on line. 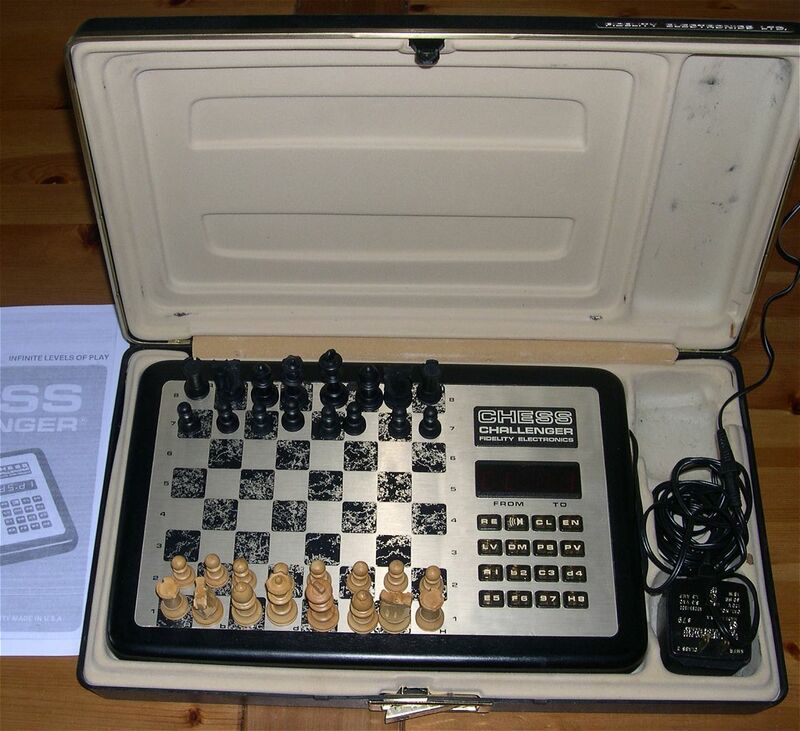 Chess Traveler was my first chess computer in 1980. 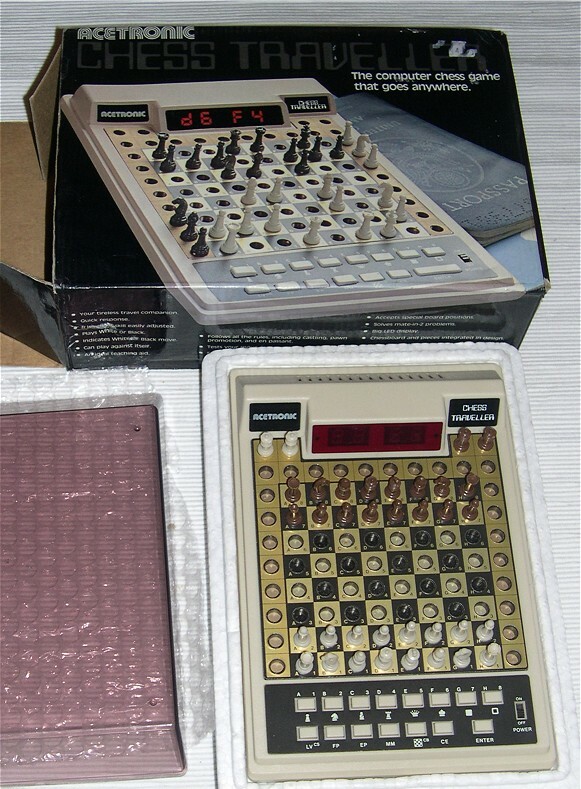 I used to play in a game shop with a Sargon 2.5 Auto Response Board. 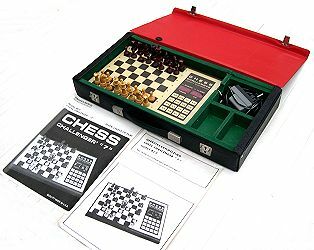 But my budget allowed me only a chess challenger 7 or a Chess Traveler. I finally bought this game because it was portable and I lost a lot against it on games at level 5 (several minutes per turn). I made progress, and here is a test game at level 5. A link: This game is available for sale on the English site Retrogames. 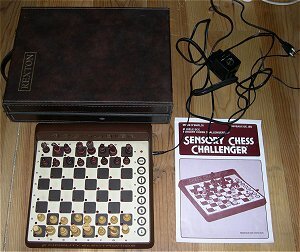 A site about the Scisys: Chess Computer UK (Mike Watters). 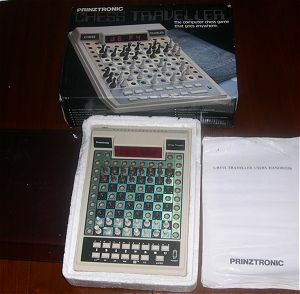 A British release distributed by Acetronic. A link: Two variants of this game are available for sale on Retrogames (English site). Another British release distributed by Prinztronic. 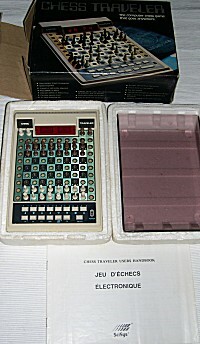 Here again, It's a Traveller with 2 l.
Prinztronic is mainly known for its vintage calculators. See the site: www.vintagecalculators.com . 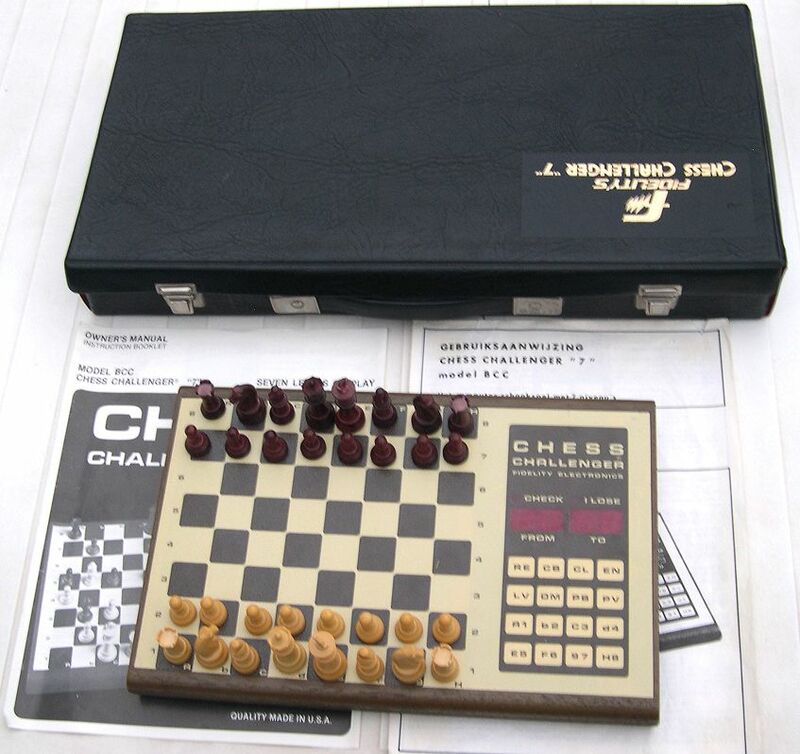 Here is one of the first computer chess distributed by Tandy / Radio Shack. It is simply named "Computerized Chess Game". And here you have the european release. 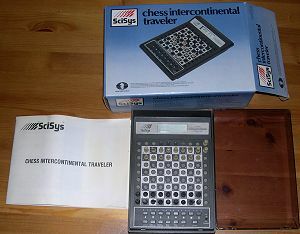 In 1982, Scisys published a Chess Traveler variant with a LCD screen. The user manual is identical except that the 8 levels are faster. Here is a test game . I replayed some moves on the chess traveler at the same level. It's a different software. This travel game is one of the first Novag game with a small 4Kb software developed by David Kittinger. It is copyrighted 1980 but it appears only in 1981. It was later declined as two variants: the Micro Chess II and the Micro Chess III. It's a curious game. I was surprised and lost my first game following a nice attack in the end of the opening. But in some situations, it really plays badly, as you can see in this test game. 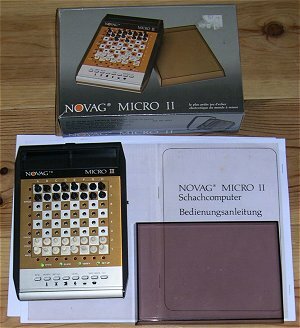 It's not easy to find the difference between a Novag Micro and a Novag Micro II. This game has also some timing problem. At level 6 (2/3mn per move), the last moves were very long - more than 15 minutes. It's a weak software but very interesting to play because of its unusual opening and game style. Here is a test game. 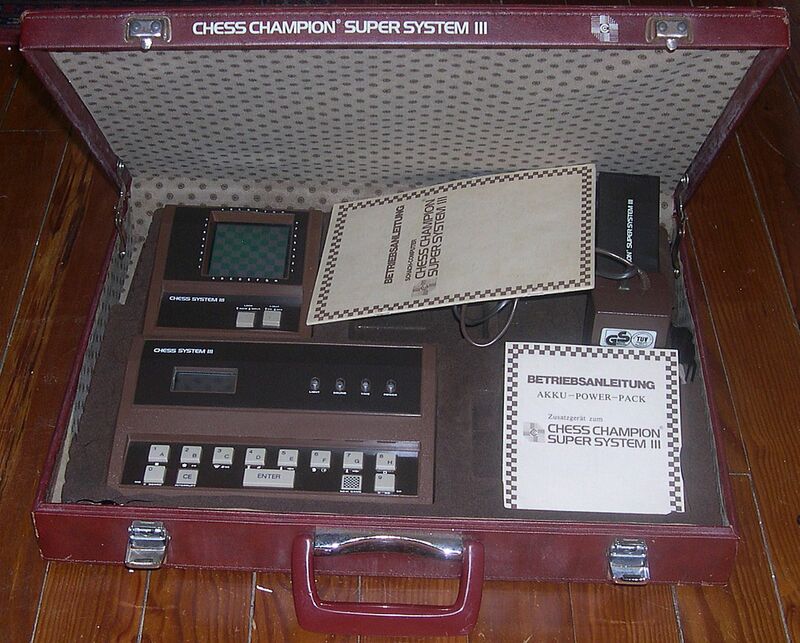 Chess Champion Super System III (1979) is a machine playing a similar level as Chess Challenger 7. 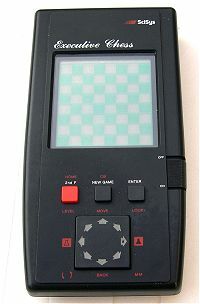 It is clearly not very beautiful, but a LCD screen was available as an option to visualize the game. This machine was well sold in Germany but poorly distributed in France.Here you have a German release. It's not a champion but it has an interesting level for mid range player. Here is a test game where I had some fun.. 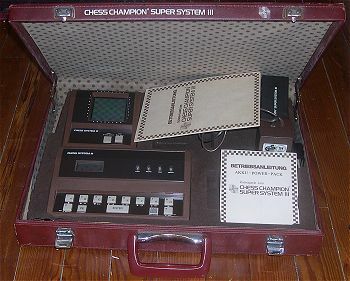 This Chess Champion Super System III is in its case with an accumulator to be used unplugged and the LCD screen. Only the printer is missing. A link: Anatoly Karpov versus Super System III. 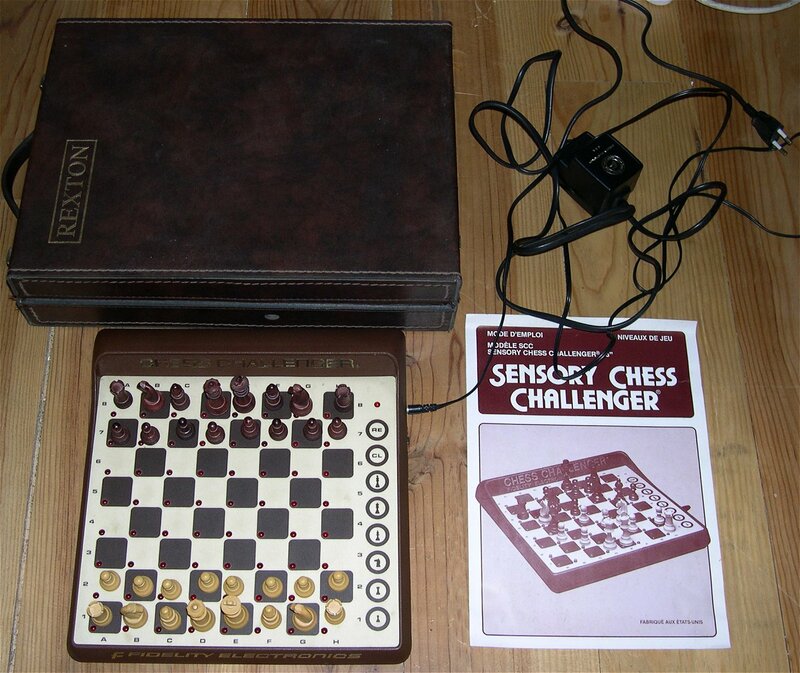 Voice Sensory Chess Challenger is an heavy wooden device with a semi-sensitive chessboard from 1980-1981. Here is a test game showing its general level and just for fun a game at level 1. It was the first program that contains a large opening library (around 1000 half moves). 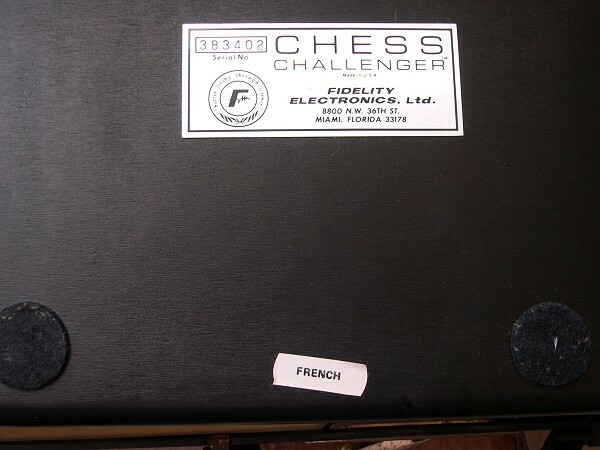 This computer chess is speaking French. 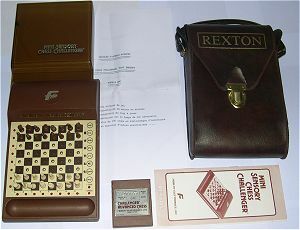 Rexton was the company that imports Fidelity games in France. The power adaptor is 8,5 VAC, 1,5A. This game looks like the Voice Sensory except the word "champion" visible to the right of the LED screen. 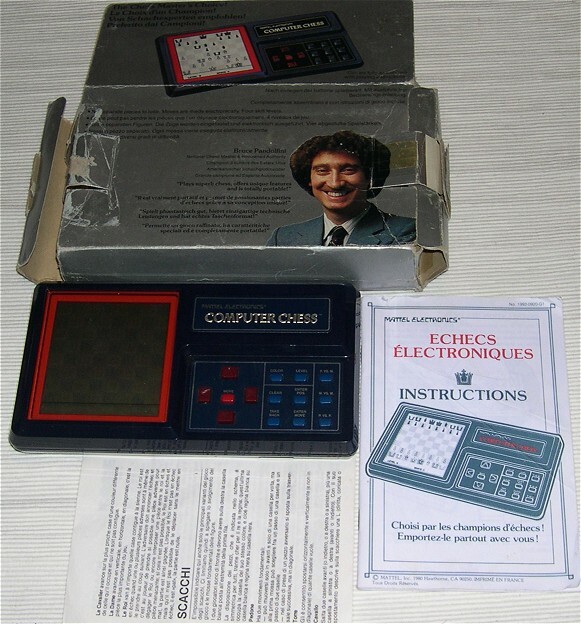 It includes the software that won the first world championship in London in 1980. It's one of the first software of Dan and Kate Spracklen for Fidelity. it's the ancester of the Fidelity Mach III. it begins to play well but still has some weaknesses in the algorithme. Here are two test games: game n°1 and game n°2. 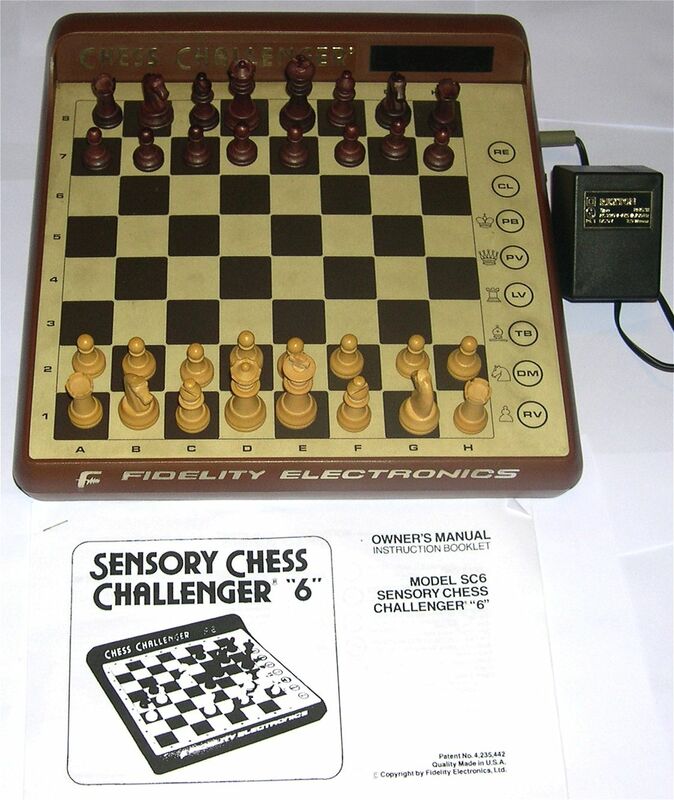 The Chess Challenger 8 is one of the Fidelity Electronics "best seller". 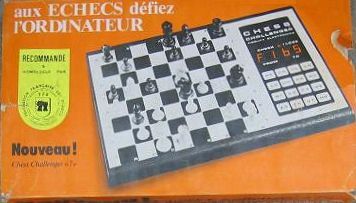 It's a program derived from the Chess Challenger 7 but to move a piece, you just have to push the starting end ending square. The computer will indicate its move by lighting a led on the square to be played. It was the first device to propose this concept at an average price. It's an interesting programme, but it has major weaknesses in opening, as you can see in this test game. 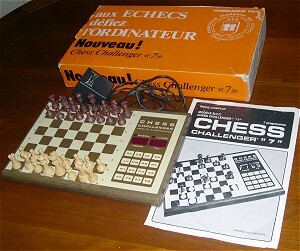 The Chess Challenger 8 design will become very popular and often reused, even on the most powerful chess computers from Fidelity: The excel Mach II III and IV. 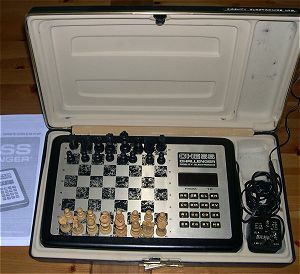 The Chess Challenger 6 was a "low cost" release of the Chess Challenger 8: it has only 6 levels; there was no led on the chessboard and the move were indicated by displaying the coordinates on a small screen on the top right. It's a weak software; its move are not very dangerous, but it does not make big errors. See this test game. 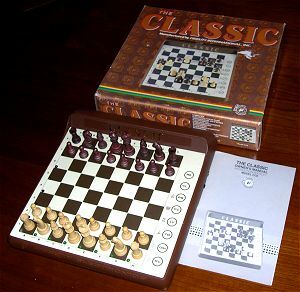 The "Classic CC8" is a Chess Challenger 8 with some minor improvements: take back on 2 half moves, hint, new levels including an infinite level (with the button "move" to top it). But there are only 15 leds to indicate the moves and it only works with batteries - hopefully, you can play between 500 and 1000 hours with one battery set. It's still a weak software, as you can see in this test game. The basic program is weak and only includes 4 levels (including one infinite). 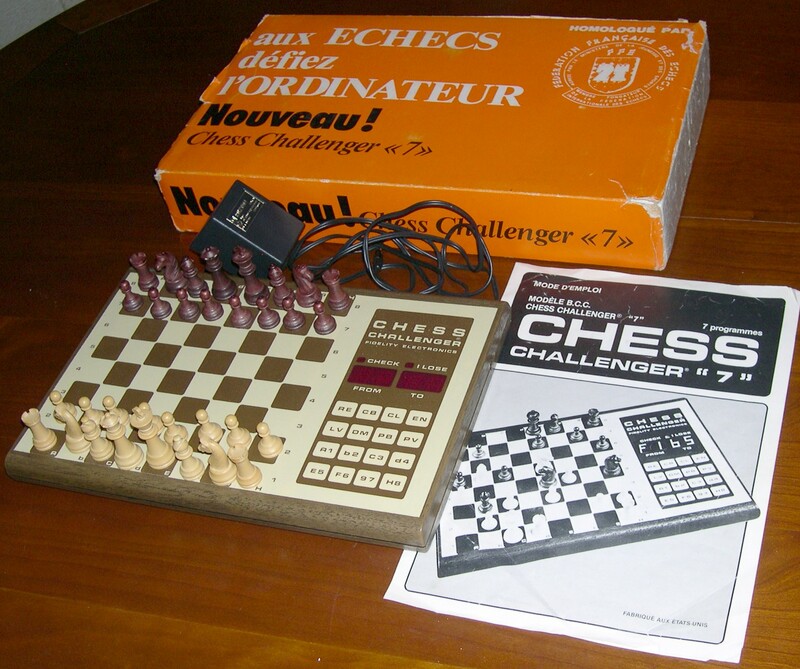 This game is here in a French release, imported by Rexton, with the very rare CAC module "Challenger Advanced Chess" and its French user manual. This module adds 6 levels of game, an opening library of 100 positions, the take back function and the mate in 2 problem solving. A test game. 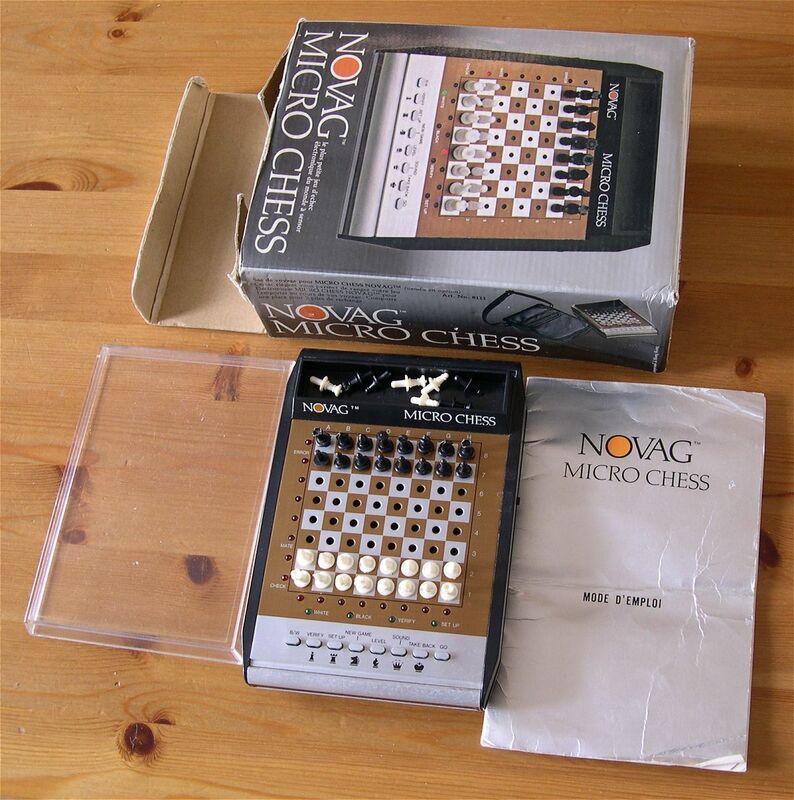 Another packaging for the Mini Sensory Chess in a French release - without module. It's a very nice design but the software is very weak. I had some fun finding an ealy mate. I succeded in 11 moves but it's probably possible to do it quicker. Here is this test game. This device was published in 1981. It's one of the first sensory board. 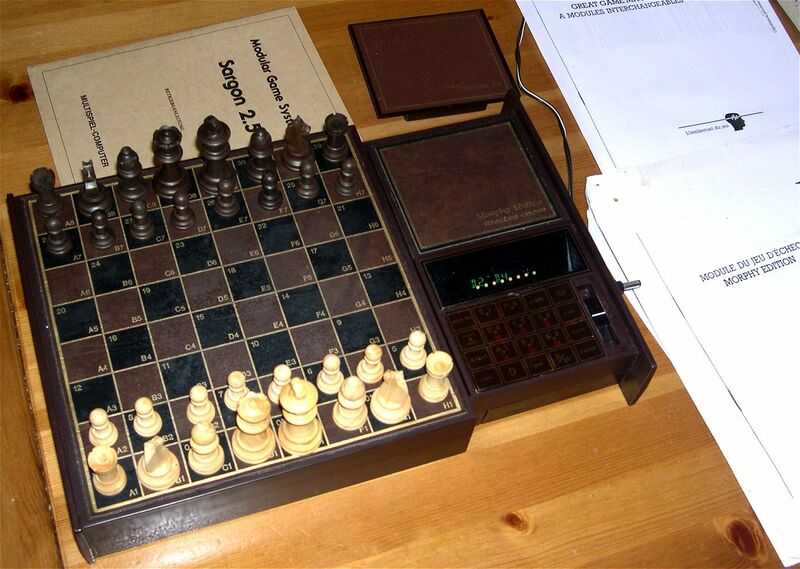 But to capture a piece (d4xe5), the player has to push 6 squares: d4 e5 e5 enter. It's a weak program and it's not a very nice design. But it's a strong design and it has a useful box to store the pieces on the box side. See this test game. 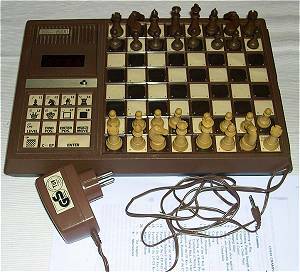 This Chess Partner 2000 Came from Germany. 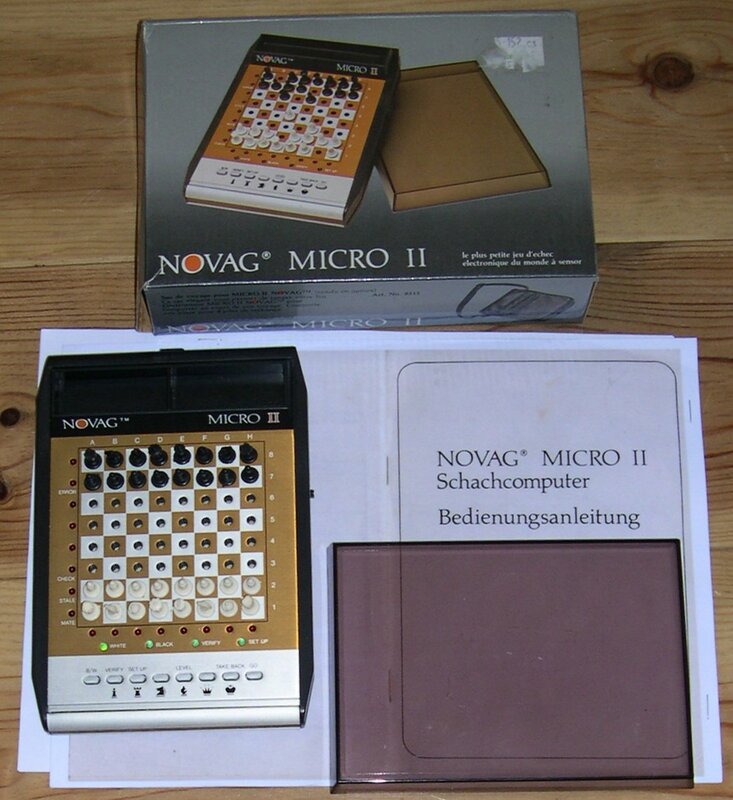 The "Novag" trademark is indicated only on the power adaptor. 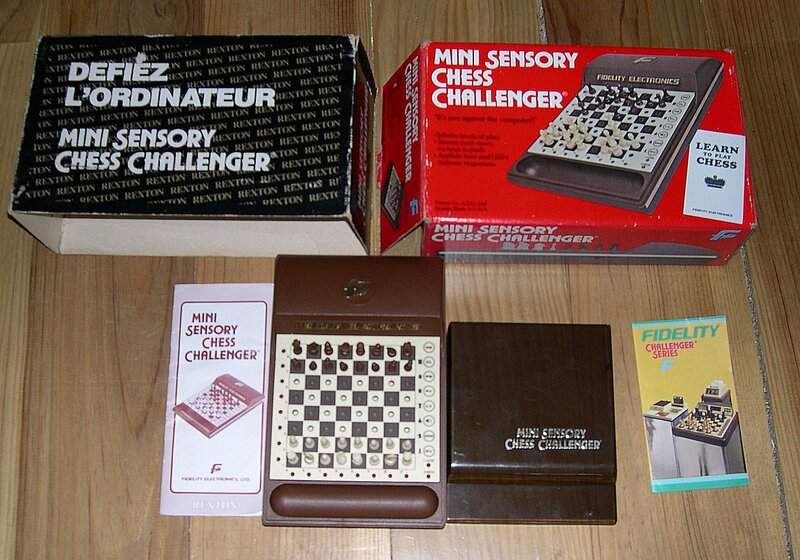 In 1980/1981, Mattel published three little electronic games in France: Electronic Chess, Backgammon and Rummy. 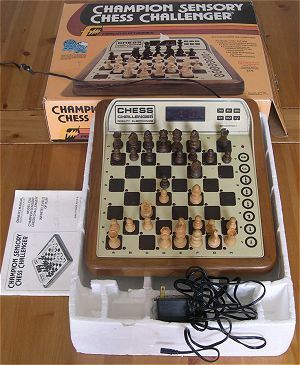 This "computer chess" was sponsored by Bruce Pandolfini, an American chess author, teacher and coach. The LCD technology was just beginning and the symbols used are non-conventional. This is a weak program in opening. 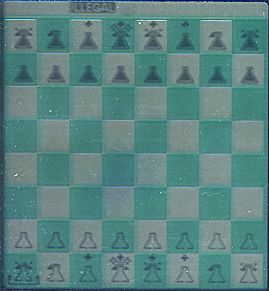 At the level max only (more than 10 minutes a move), it defends not so badly: see this test game . It has also some bugs, perhaps because it's an old device (For instance pieces lost when switch off in save mode). The Scisys Executive Chess is from 1981. It was also distributed under the name "Senator Chess" in Germany. For that period, the display quality is acceptable. 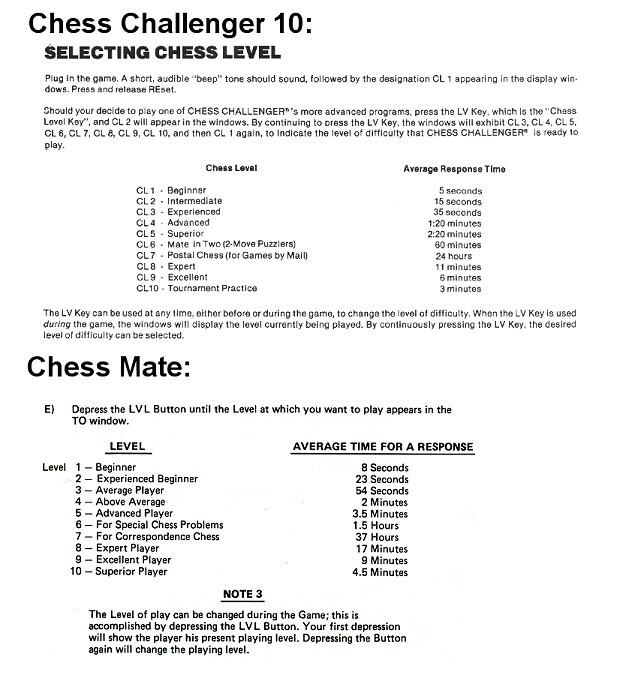 It's also easy to use: I do not have the user manual but the sheet on the rear side is enough, except to know the average time of the 8 game levels. 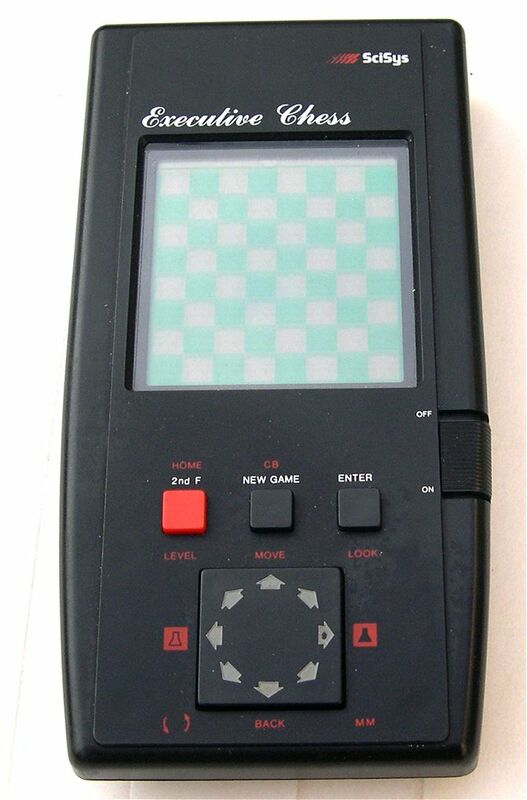 The main missing functions are the following: no beep at each move and no memory save when the game is switched off. This game did not have a lot of success. Its game level is weak, see this test game. But its overall design was later reused, for instance on the Gakken Computer Chess or the Saitek Kasparov Chess Shadow. 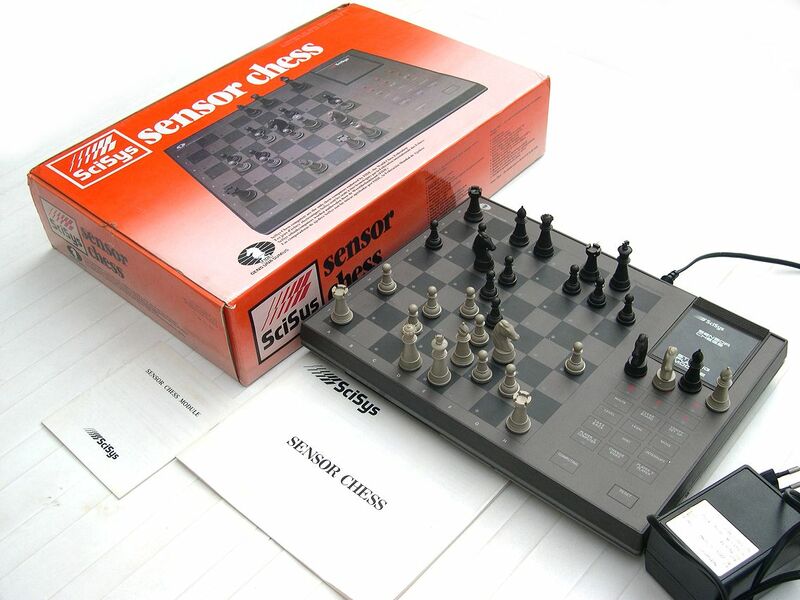 The Scisys Sensor Chess is from 1981. Three modules will be later published: Strong Play, Classical Style and Hypermodern. This game includes the strong play module that mainly adds two new functions "hint" and "legal" (that displays all the possible moves). Without this module, the two corresponding keys on the keyboard are not working. This software is from the begining of the 80s. It is not very strong as you can see in this test game. A link to the reference web site about Scisys: http://www.chesscomputeruk.com. 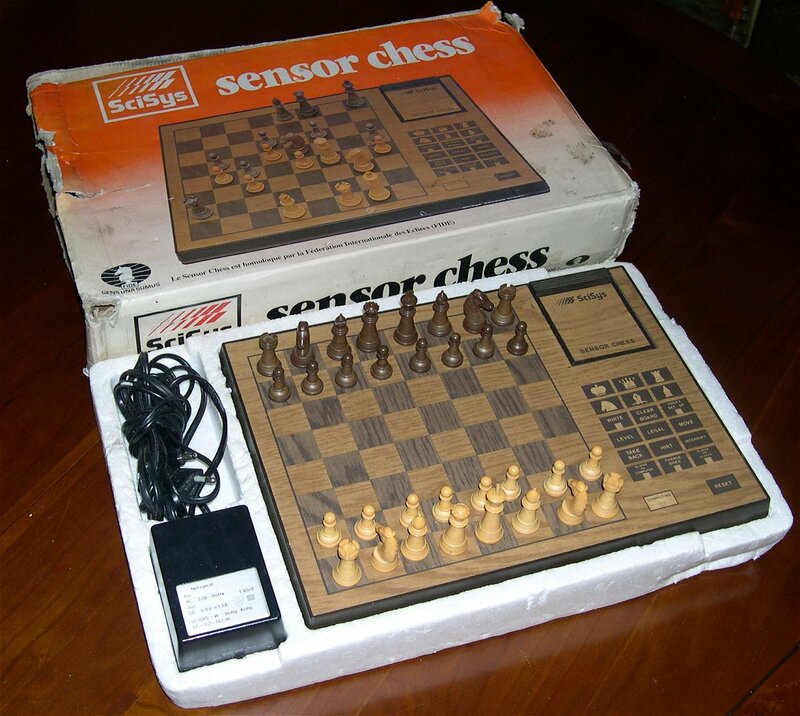 The Scisys Sensor Chess also existed with a fake wood design. Here is a test game . This game has the original packaging but it is a lot damaged. 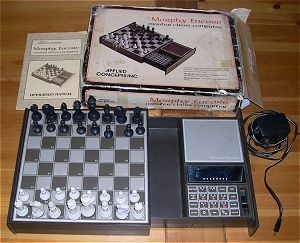 Morphy Encore is the successor of the famous Sargon 2.5, that was the first program with a correct level. Its gamestyle is very nice and it is still today a good game to learn chess. But of course, it is missing processor power. It means not enough attack strategy and good position knowledge. 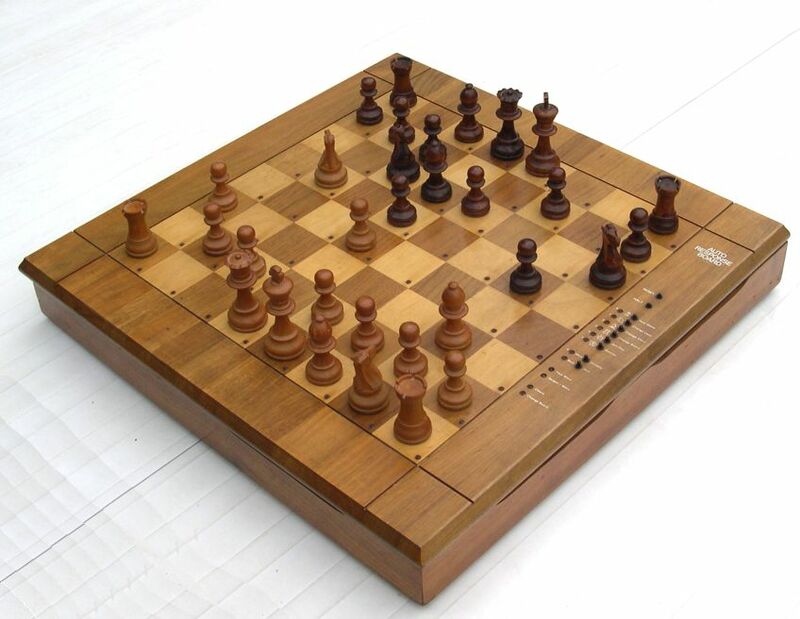 To beat it, you just have to take care of its attacks, take time to well defend and build step by step a winning position, by concentrating the forces and exchanging its defensive pieces. Here is a test game. 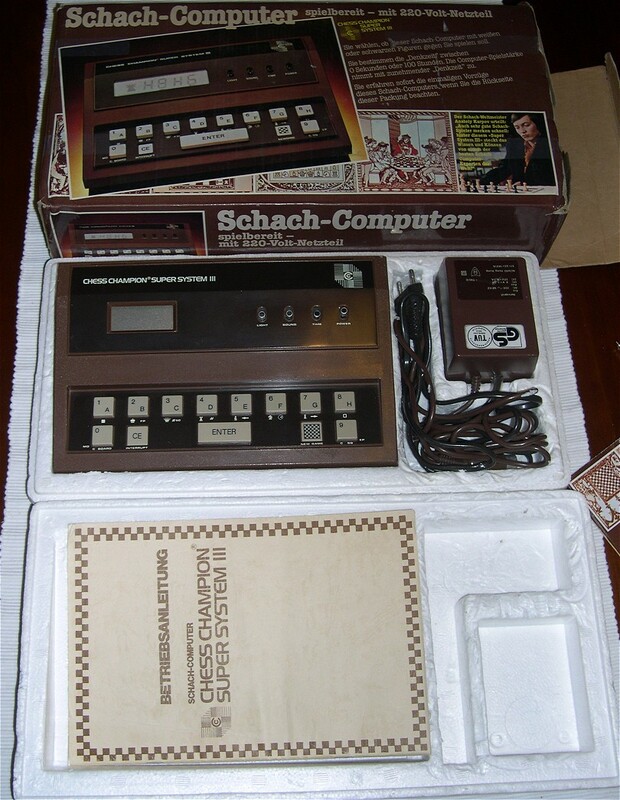 The Steinitz module was the last module published in 1983 for the Great Game Machine. The number 4 should indicate a 4MHz processor but as this implies changing a large amount of the hardwrare, it finally was running only at 2 MHz. Its successor "Mega-4" remained a never published project. On the very good French site www.blitchess.fr, you can read an extract of Europe Echecs n° 292: "Steinitz better than Morphy but disapointing". Applied Concepts had obsolete games: the Great Game Machine and its modules were to expensive. With the Sensory 9, Fidelity had a stronger game, was cheaper and did not need a keyboard to enter moves. So Applied concepts Inc returned to more profitable business. Here is a test game.